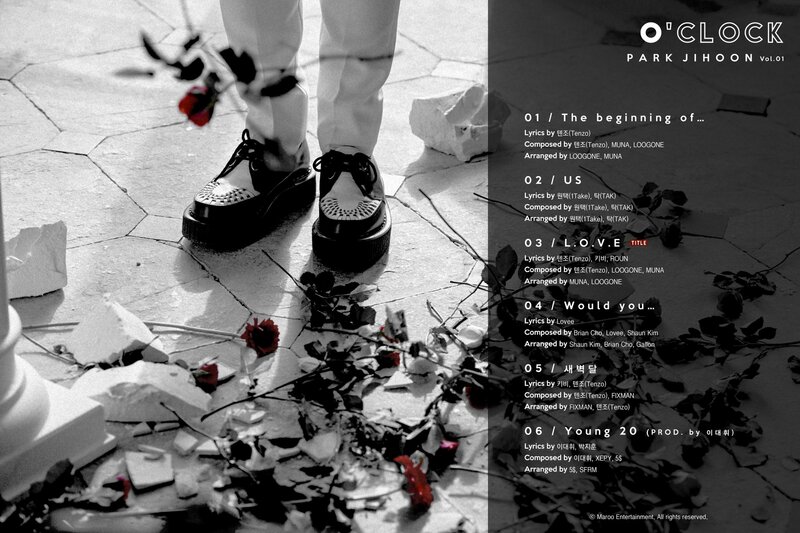 On March 17th, Park Jihoon released the track list for his debut album ‘O’CLOCK‘. Check it out below! The album has six songs in total, including the title track ‘L.O.V.E‘. Jihoon‘s former fellow Wanna One member Lee Daehwi has produced the last song ‘Young 20‘. Jihoon also participated in writing the lyrics along with Daehwi. Daehwi is known for his amazing songwriting skills, so Wannables are definitely excited to hear this collaboration. The former Wanna One member Park Jihoon will make his debut as a solo artist on March 26th with his first mini album ‘O’CLOCK‘. Since Wanna One disbanded, Jihoon has already featured on Ha Sungwoon‘s pre-debut track ‘Don’t forget‘. Even though he has received several offers to appear in dramas, he has instead decided to debut as a solo artist. Jihoon is the third former Wanna One member to make his solo debut – Yoon Jisung and Ha Sungwoon made their respective debuts earlier this year. Stay tuned! What do you think about Park Jihoon‘s track list for ‘O’CLOCK‘? Let us know in the comments below.